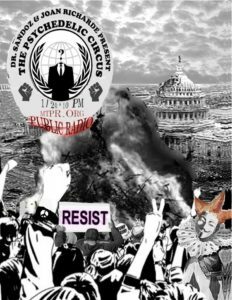 Psych Power Hour presents The Psychedelic Circus: Resist! Tomorrow, Saturday the 28th, tune in for a re-broadcast of “The Psychedelic Circus: Resist!” originally aired on Montana Public Radio, January 20th, 2017. Join Doc Sandoz and Joan Richarde as they play protest music from the 1960s and early 1970s in celebration of the spirit of dissent that is rockin’ and rollin’ across the globe. 7pm UK, NY, SF. Listen to the archived show here: Resist! « This Saturday tune in to Jive 95-KSAN, San Francisco, 1969!